Hatters boss John Still praised striker Mark Cullen’s commitment to the cause after his return to the first team yesterday. The leading scorer was dropped from last week’s defeat to AFC Wimbledon with doubts surrounding his future, as Still confirmed he was considering a move elsewhere. However, Cullen took the club’s official Youtube channel to clear the air and was back on the bench for the 2-0 win over Accrington Stanley. Still said: “It’s a difficult one. I made it quite clear at the time, I don’t want anyone who doesn’t want to play for Luton. “In discussions with Mark, he was looking to what was possible for him. He’s a young man and everyone has to be sensible, because people make mistakes, they do. “Mark came up to us, while the negotiations were possibly going on between the two clubs and said that if someone shows interest in me, that I think I should look into, I would like the opportunity to do it. “Not to say that he was going to go, or that he didn’t want to play for Luton, but he would like to explore other avenues if something comes up. 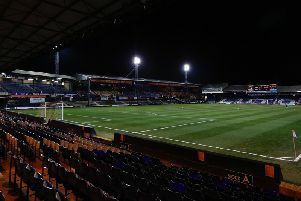 When Cullen was introduced late in the game, he received a warm reception from the majority of the Kenilworth Road crowd as midfielder Luke Guttridge said: “As players, we haven’t really known too much about it. Cully has not been a problem. Whatever has happened, has happened, and I’m delighted that he’s come on. “Whatever has been said I’m just delighted that the fans took it the right way. Meanwhile, Still also reiterated that the club had never been looking to offload Cullen, but they couldn’t stop other clubs bidding for the 12-goal striker. He added: “The bid didn’t match what we felt Mark’s value was. I think people who know me, even when he was in the team, I said the unluckiest person at the club is Mark Cullen. “He’s come on, he had a go, been sharp, been bright. As far as I’m concerned, we never made Mark Cullen available for transfer.